So, what else is new at GearGems? Want something unique to wrap a gift in? Many GearGems themes are now available printed on wrapping paper, with more to be added! Available from Zazzle. Click here to buy! Tell me about it! I’ve restored so many worn out photos to optimal digital condition in the normal course of my life and my design work that I’ve decided to offer my services to you, my customers, as well. Many people have old cherished pictures that have suffered the ravages of time, and don’t know what to do with them. Well, in many cases, I do know how to make them presentable again! I can fix fading or discoloration, do spot removal, and more. Click the pic to see more details and examples! How about some neat bottles for your water? 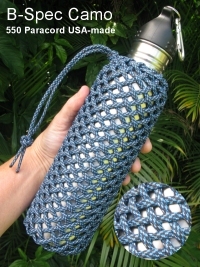 Click these pics to see and read all about the exciting new hand crafted knotwork Survival Paracord Drinking Bottles we’ve added to our site’s offerings. These make great gifts!